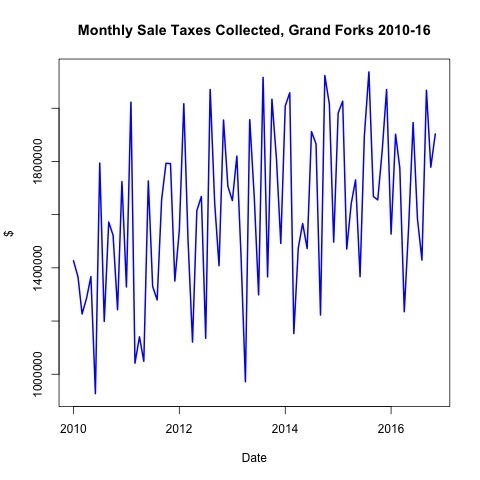 Yesterday’s post (found here) mentioned Grand Forks retail and the fact that sales were behind last year’s level. As a recap, the accumulated total of monthly collections in 2016, when compared to the same month in 2015, were all lower, and in some cases by significant amounts. Collections from a few specific months were ahead of the same month the year before, but the accumulated total never got higher than 2015. Here is the standard time series display. The link is to the higher resolution PDF version of the graph. There was hardly a significant trend up or down for the series in this time, and it looks like there is likely some seasonality in the data. Hardly a surprise when we are looking at monthly sales tax collections. This graph is actually not terribly useful. However, if we look at the accumulated collections by year across the different months, I think it tells a better story. 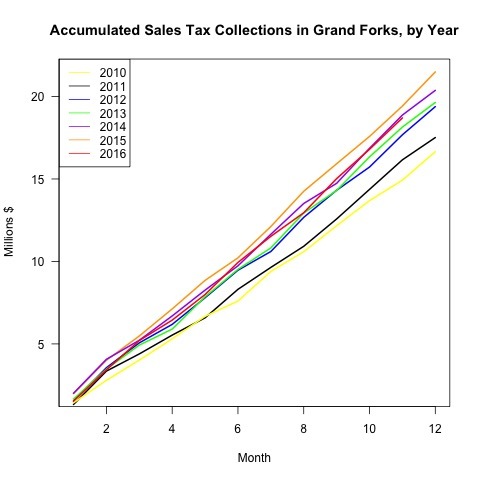 What is easier to see now is that the year 2016 was behind 2015 sales tax collections, though it is worth noting that 2015 was the best year in the sample for collections. You could perhaps argue Grand Forks was due for a down year (please nobody make this argument), though we could suggest this was the manifestation of negative state economy effects, as well as local. The fundamentals for the coming year are hardly encouraging at this point, making the revenue generation for the local economy something of a question mark. This is certainly worth watching as the legislature meets to set the state budget for the coming year.